The Silver-beaked Tanager belongs to the family of birds known for their beautiful colours: the Thraupidae (Tanager) family. As the name suggests, this bird’s beak, which is swollen at the base, appears to be a glistening silver in the field. Without sunlight shining directly on it, this bird appears to be black. 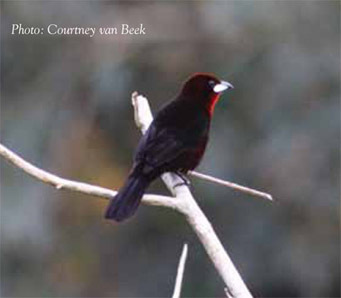 However, when in the light, the Silver-beaked Tanager looks as if it were maroon-coloured velvet. One can see its bright crimson chest and throat. The female of this species is far less impressive with a black beak and dull reddish-brown feathers. This Tanager is found in South America and Trinidad where it inhabits forest borders, estates, semi-open areas, secondary growth and even some neighbourhoods. The Silver-beaked Tanager can be heard at dawn singing “che-wa” for its human and avian friends. It eats fruits of Melastomaceae, other small shrubs and several bromeliads. It will occasionally drink nectar and will also feast on insects. Instead of sallying for their prey, they simply flit forward to grab them. Sometimes referred to simply as the “Silver- beak”, this bird will either be found in pairs or groups of an average size of seven birds. It moults from May to December with a peak in August and September. It calls regularly from January to July.